Raise your hand if you have some Disney fans in your house! I know we sure do! 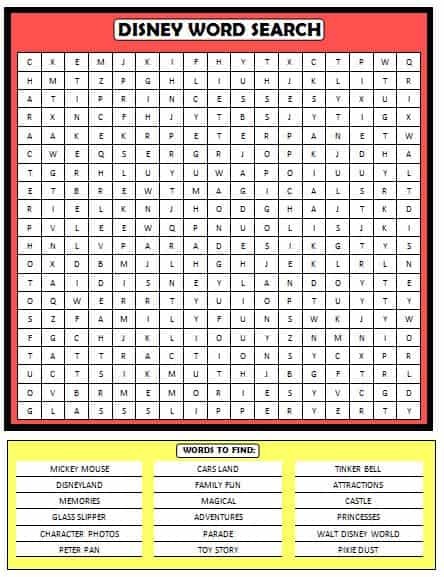 Here’s a fun Disney Word Search game that’s perfect as an indoor activity for the kids or to print & play on a trip to one of the fabulous Disney Parks. By the way, if you’re heading to Disneyland, check out our page dedicated to Disney fun. After our first trip to Disneyland, I wrote posts about fun things to do in both of the parks, all of the new excitement in Cars Land, traveling to Disney with a toddler, traveling to Disney with a child who has a food allergy and so much more! Click here for the free printable Disney Word Search. Quick – what’s the first word that comes to your mind when you think of Disney? I’d love to read your answer in the comments below. Is the word you thought of one of the searchable words listed on this Disney Word Search game? Want more fun & free Disney games? Check out DisneyJunior.ca for colouring pages, crafts, games and more! We’ll soon be taking a trip to Walt Disney World and we’ll be adding travel tips to Moms & Munchkins. To stay updated on Disney travel tips and all the family fun ideas we have to share, follow along on Facebook, Pinterest and Twitter. If you’ve been to Walt Disney World, do you have any tips to pass along to the rest of us? Let us know in the comments section below. For more fun & free printable games, check out our Printable Games page. There you’ll find loads of scavenger hunts, charades, BINGO cards, trivia games and much more. Yes, they are all FREE for you to print and enjoy with your family. oh wow that is a nice word search – love word searches! Thanks for sharing! This is great! Anything to keep the kids occupied! cool word search – I am about to head over to find the other cool ideas on disney jr!